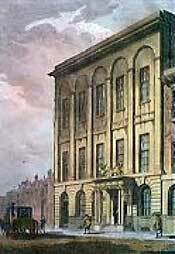 The Mansion House has been the Lord Mayor’s residence since 1758 and one can take a guided tour. The Egyptian Hall is grand at night, and the picture collection is beautiful. 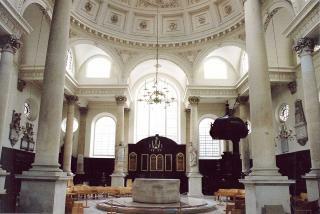 St Stephen’s Walbrook was Wren’s own parish church. The first stone was laid in 1672 and it is considered a dry run for the dome in St Paul’s Cathedral. The contemporary controversy concerns the Henry Moore altar. 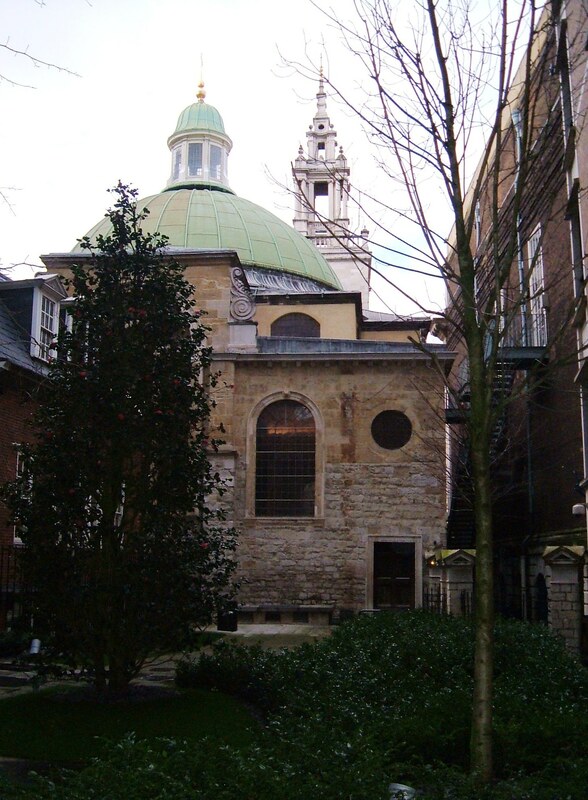 Some consider it inappropriate, both to Wren’s sense of space and light under the dome and to the religious beliefs of the times which placed the emphasis on the pulpit, rather than the altar. 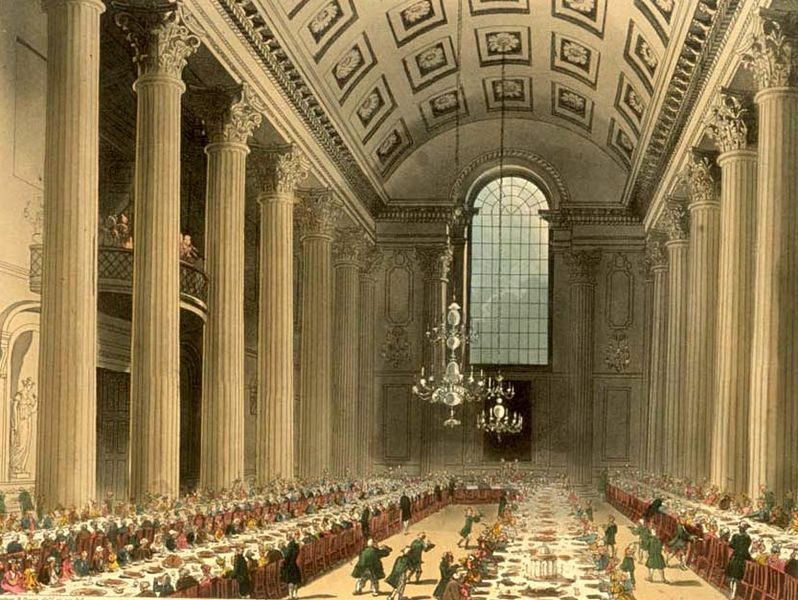 However, in Wren’s time there were high box pews, which is why the base of the columns is so high, so the space was not empty. I have mixed feelings: I find the Henry Moore altar rather lumpish, but it is still an altar and the positioning reflects a contemporary approach to worship, and it is after all a church, and not a museum. All these reflections while listening to the Friday lunchtime organ recital – quite splendid! 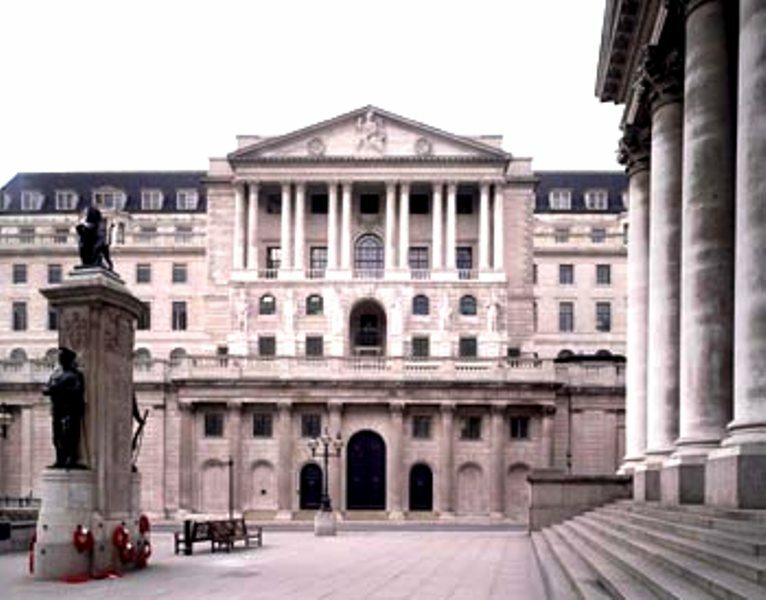 The Bank of England comes next and I recommend a visit to the museum, entry free, in Bartholomew Lane. 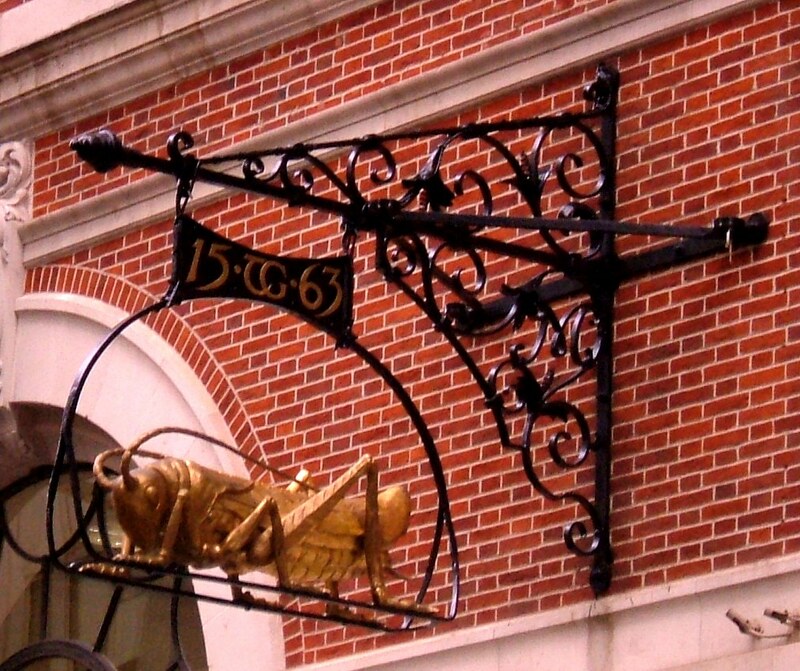 The history of the Bank is fascinating, highlighting the power and wealth of the Goldsmiths, Mercers, and Grocers in early days. 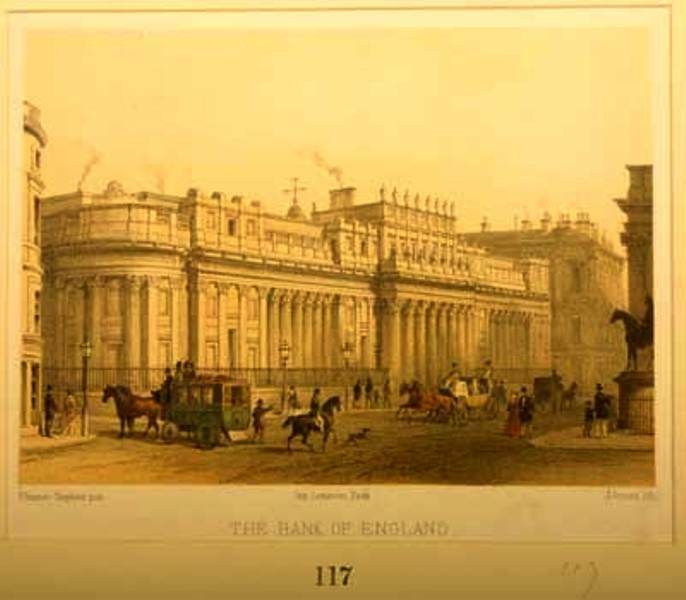 The ‘Old Bank’ was the work of Sir John Soane who was appointed Architect and Surveyor to the Bank in 1788 and remained as such for forty five years. Bradshaw mentions the ‘..lofty dome..’ and you can see a reconstruction in the museum. 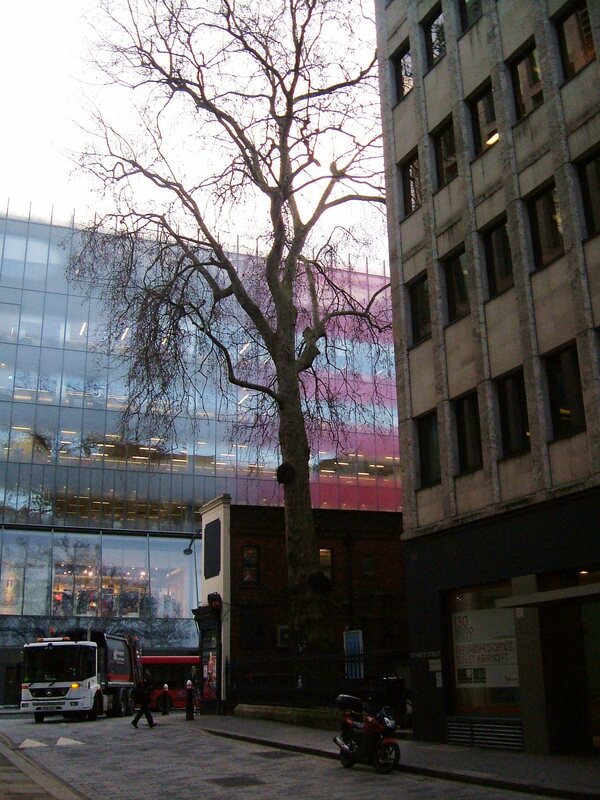 Sadly, Soane’s building has gone, only the curtain wall remains. 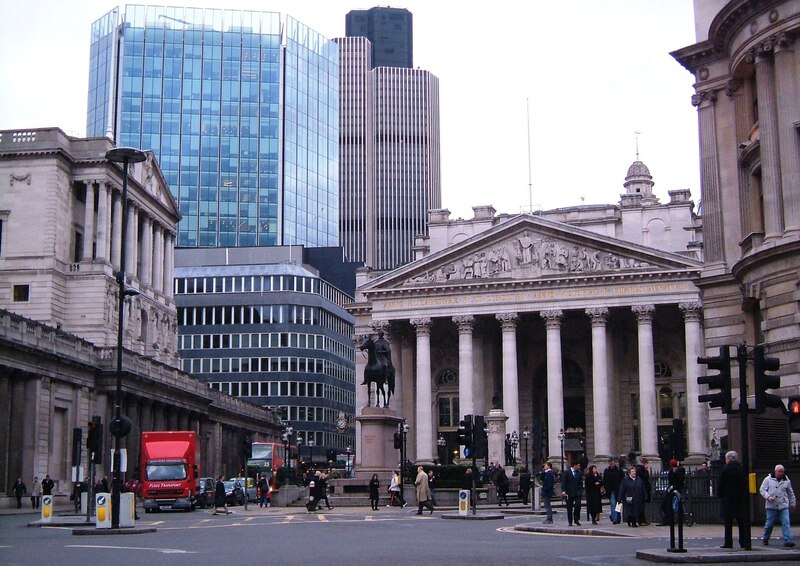 The Stock Exchange was in Capel Court, but has now moved to Paternoster Square. 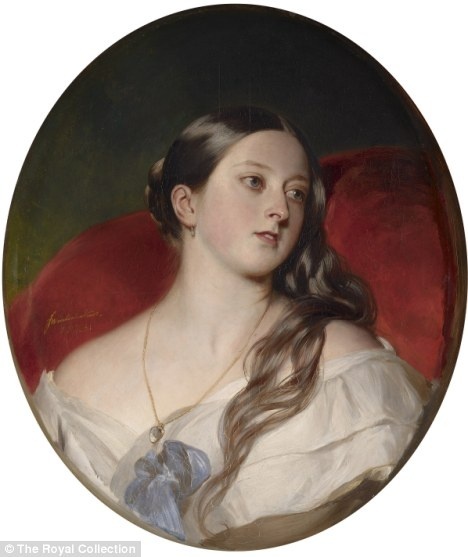 (Fascinating pictures here.) 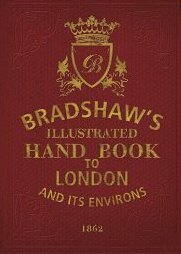 Mr Bradshaw explains ‘lame ducks’, bull and bear markets, and the ‘..most ingenious tricks devised..’ to ensure the best deals. 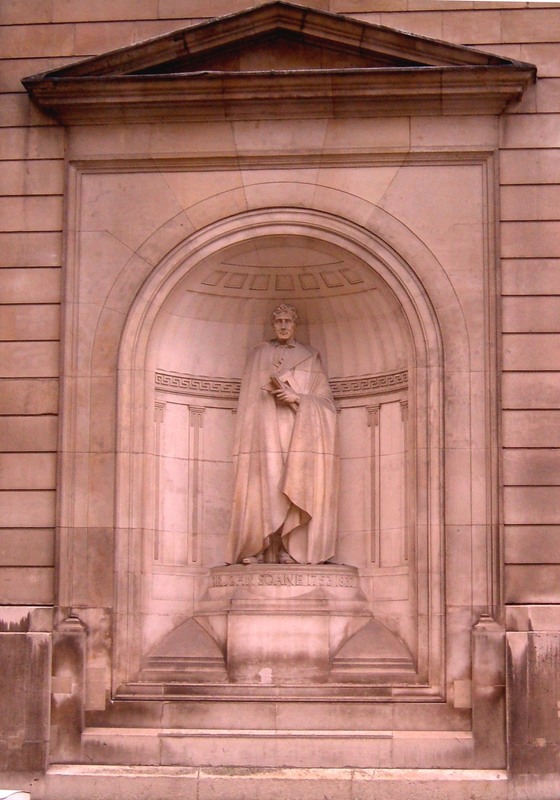 The Electric Telegraph Company was in Lothbury and only the facade remains, hidden between two buildings, on the site of Founders Hall. 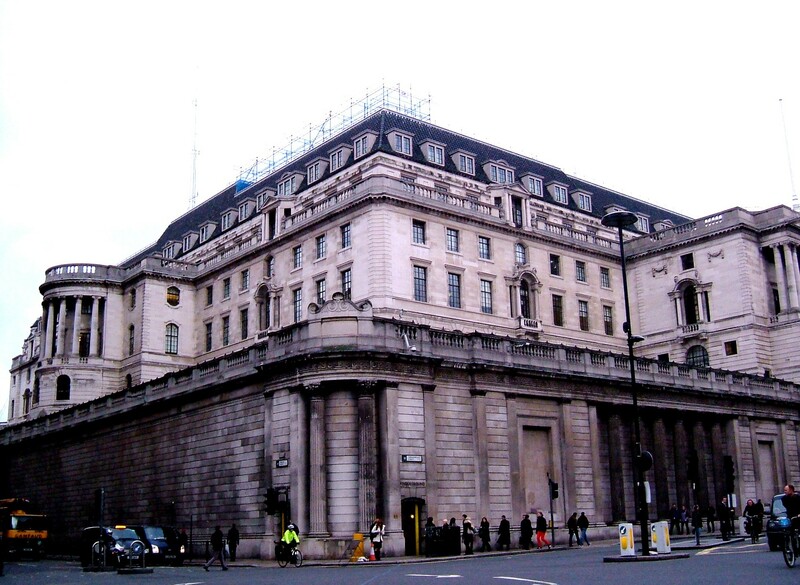 From this office ‘..the wires, that have a subterranean communication with all the railway termini in London, [and] receive and diffuse intelligence with astounding rapidity..’. 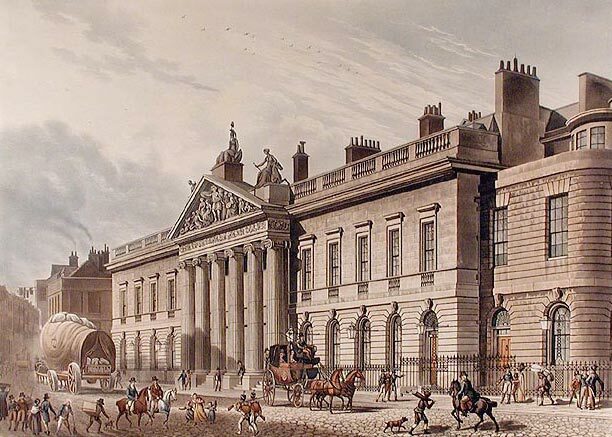 Cornhill was a shopping street, and although there are shops, to most of us ‘shopping’ is more like Oxford Street, or Knightsbridge! 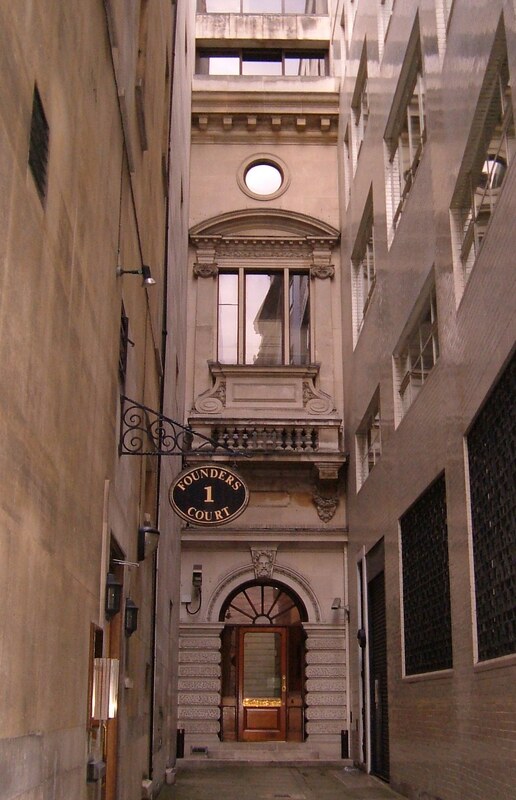 However, I did find a carved door at the Cornhill Insurance building, saying that Birchin Lane was an area where gentlemen could purchase fine apparel, and so I asked Mr Bradshaw to wait for a moment or two…. 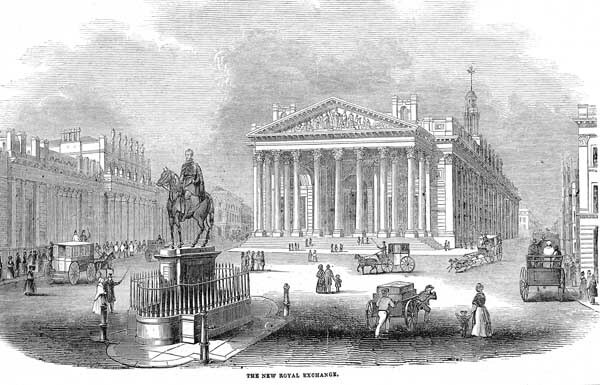 At the end of Cornhill is Leadenhall Street, and here I looked for East India House, but it was demolished shortly after Mr Bradshaw described its ‘..stately-looking edifice..’ and the Lloyds building now stands on the site. 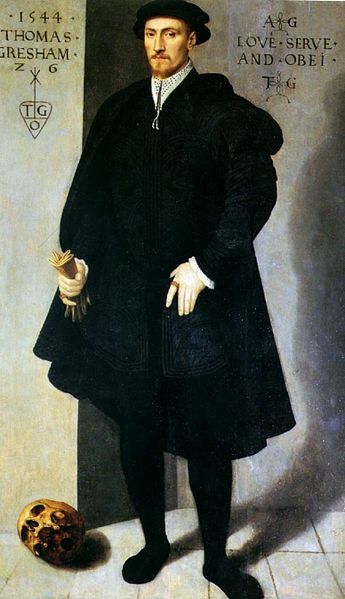 In addition to Mr Bradshaw this is an interesting site about the East India Company. 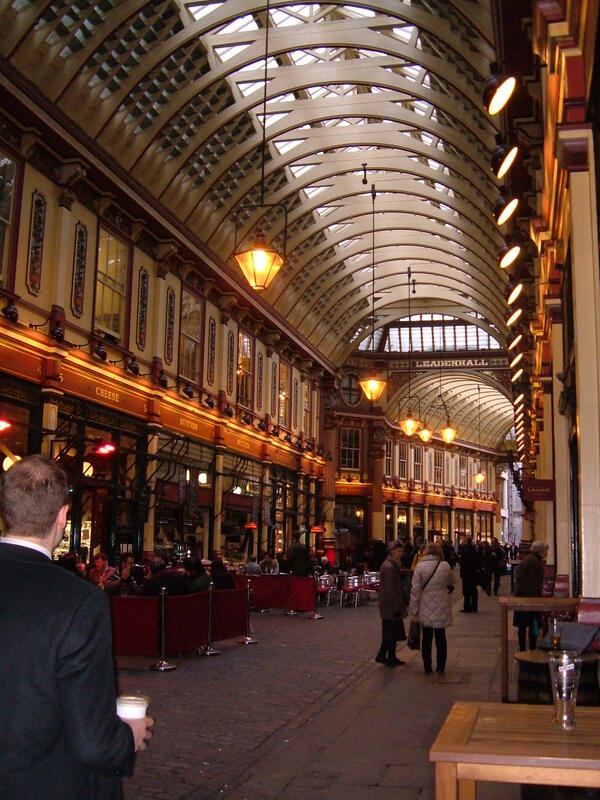 Leadenhall Market was a sad sight – even I can remember the wonderful meat and game merchant, the fish stall, and the amazing cheeses and breads. 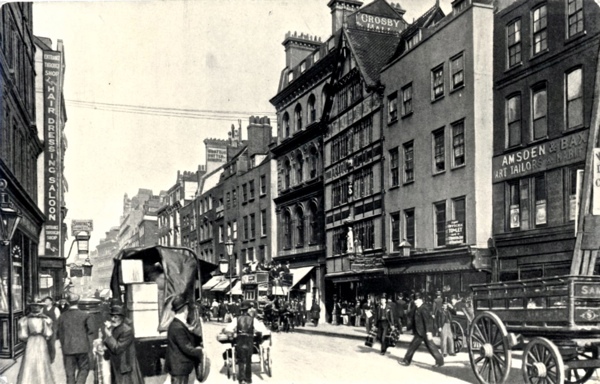 It is filled with eateries now, but no longer a market as I remember, or as Mr Bradshaw would have recognised. This site has wonderful photos of the market. Moving on into Bishopsgate Mr Bradshaw felt Crosby Hall was remarkable. 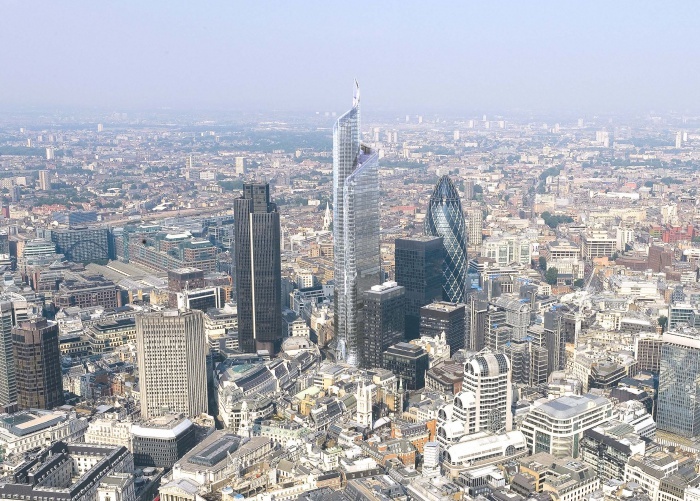 It too has disappeared, to be replaced by the Pinnacle, the tallest building in the City of London, and in the European Union – would Mr Bradshaw be impressed? 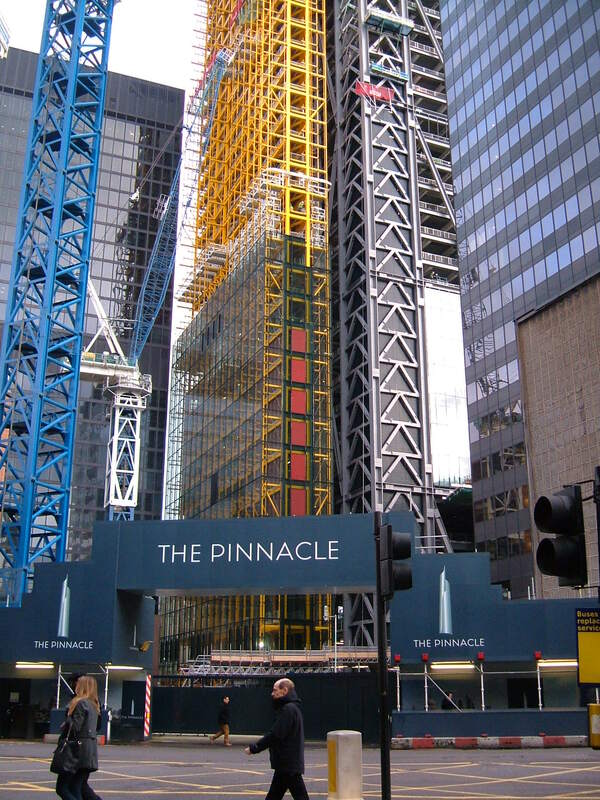 The London Tavern (corner of Fenchurch Street and Mark Lane) has gone, and only a few pubs remain in the area. 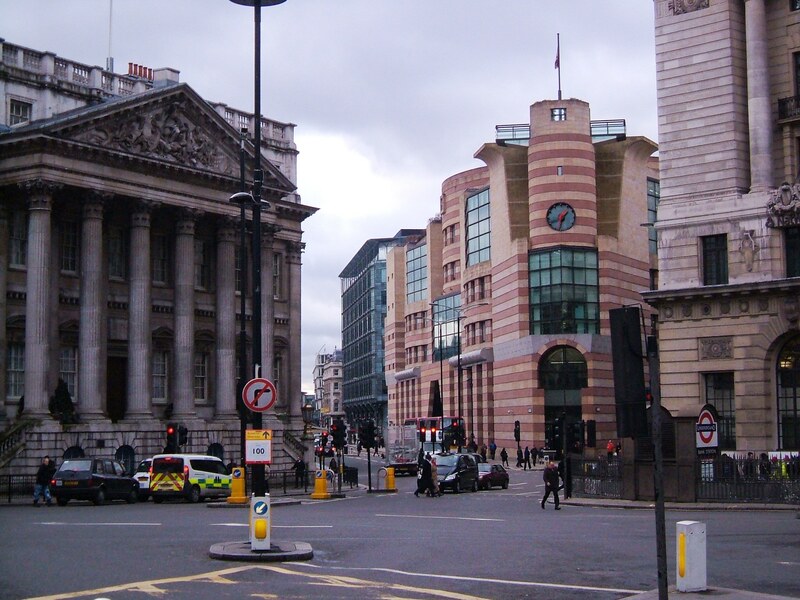 The Gherkin now stands on the site formerly occupied by the South Sea House and the subsequently the Baltic Exchange. 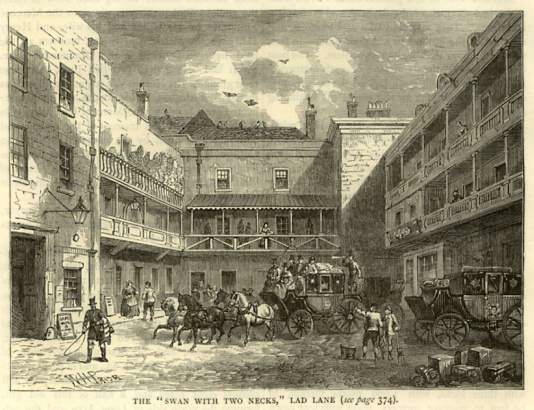 Gresham Street swallowed up Lad Lane and was the site of the Swan with Two Necks, a most comfortable hotel. I believe this was at 41 Gresham Street, but again no more. At this point I was somewhat despairing that I would find anything remaining from Mr Bradshaw’s guide and then I came to the Churchyard of St Peter Cheap, ‘..a little enclose churchyard..’ with a a large tree, surely the ‘..fine old elm..’ which Mr Bradshaw describes? I hope so. St Peter Cheap, and the old elm tree? Messrs Morley’s establishment which extended from Milk Street to Wood Street is now a shining office block, with people in rows in front of double computers, rather like clerks in a Charles Dickens novel. 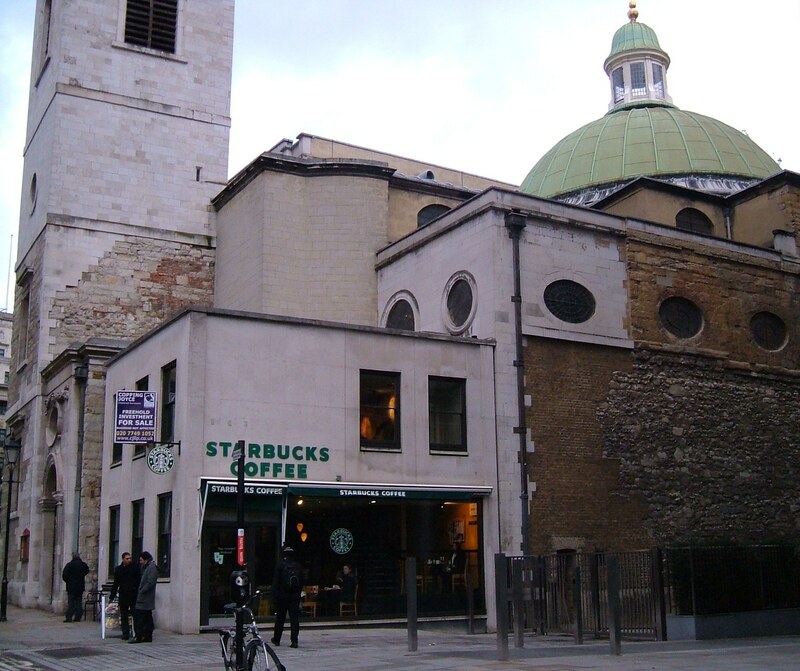 And so, Bradshaw under arm and somewhat deflated I returned to St Paul’s Cathedral, and made my way down Watling Street, with a diversion down Bow Lane, to Cannon Street station.